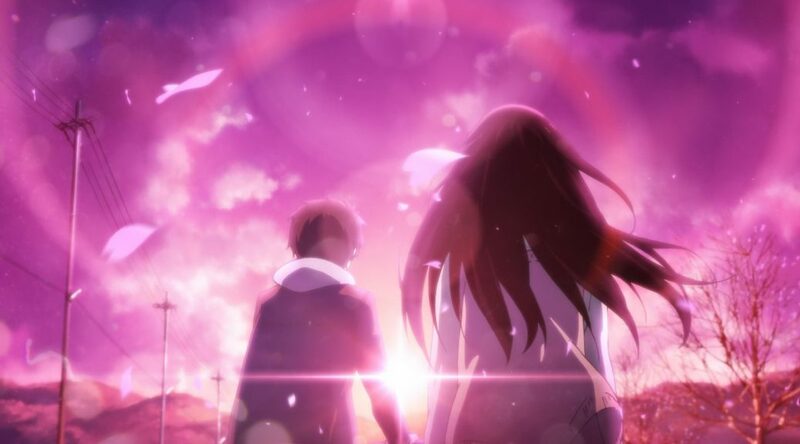 Our final Hyouka staff translation is yet another conversation with its director and series composer, with perrhaps their most insightful look back on the series after it wrapped up. Enjoy this bittersweet adolescence tale one last time! Yasuhiro Takemoto – Anime series director, animator, unit director. Member of Kyoto Animation’s Board of Directors. Notable works include Full Metal Panic? Fumoffu, High Speed!, and The Disappearance of Haruhi Suzumiya, among others. Shouji Gatou – Author, script writer. 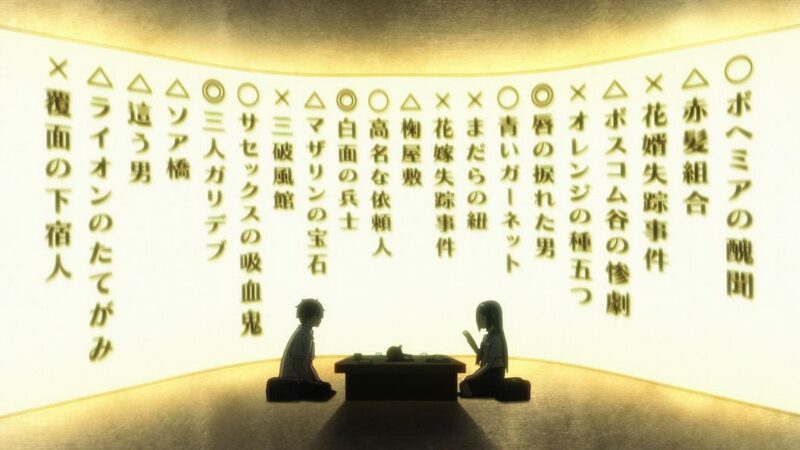 In charge of the series composition for Hyouka. Notable works are the Full Metal Panic! series, The Melancholy of Haruhi Suzumiya (scriptwriting) and Amagi Brilliant Park. ─ With Hyouka’s anime production having come to an end, please share your thoughts about this title with us. Takemoto: The mystery genre was tough, particularly keeping in mind details about its presentation and the logic behind it (laughs). Gatou: Are you referring to its coherence? Takemoto: No, coherence is essential in every genre; it was the sheer quantity of information that was difficult to handle. I wanted to focus on the dramatic aspect but it was also mandatory to include the mystery-related information, so it was troublesome. Gatou: That’s something you had also said before the production had even started (laughs). Takemoto: At the Service Recognition party the other day, I had a discussion with Yonezawa-san about how tough mystery is (laughs). After finishing the production, I felt saddened that I had to part ways with Houtarou, Eru, Satoshi and Mayaka. They’re really adorable and my emotional attachment to them is strong. Gatou: In my case, I feel like I learned a lot from this, since I had never written such a series before. The way you grasp the story, the angle you take to tackle it, are different from my own work so it was a real eye-opener in many ways. ─ Considering the novels Gatou-san has written so far, such as Full Metal Panic!, the genre this time does indeed seem fundamentally different. Gatou: That’s true. Again, most of my own stories are of the pow-pow kind (laughs). 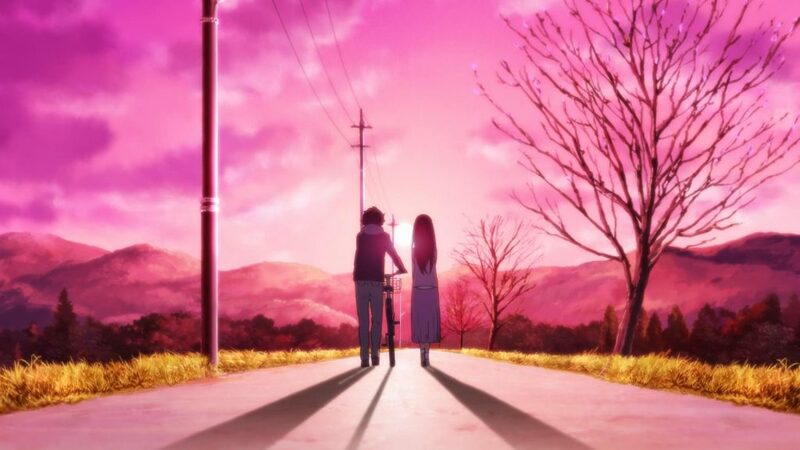 I had written a lot of stories about humans who are well aware of what they want to do and how to act, only dealing with mature casts, but in Hyouka I wrote about immature humans and their conflicts. For example, in Jirou Tanabe’s case in The Order of Kudryavka I couldn’t help but think “Just tell that student council president Muneyoshi Kugayama directly!” (laughs). That concept of wanting to express something but not being capable of bringing oneself to just doesn’t normally cross my mind. ─ I see. In a previous interview, director Takemoto said this work’s theme is the thorn of adolescence, and the story about Tanabe and Kugayama was truly just like that. Are there any other scenes in the second cours where you were able to capture that feeling? Gatou: I’m curious about it (laughs). Takemoto: It does make you curious (laughs). ─(laughs). I got the impression that the painful memories everyone surely has experienced in their high school days were dug up in the Order of Kudryavka story. 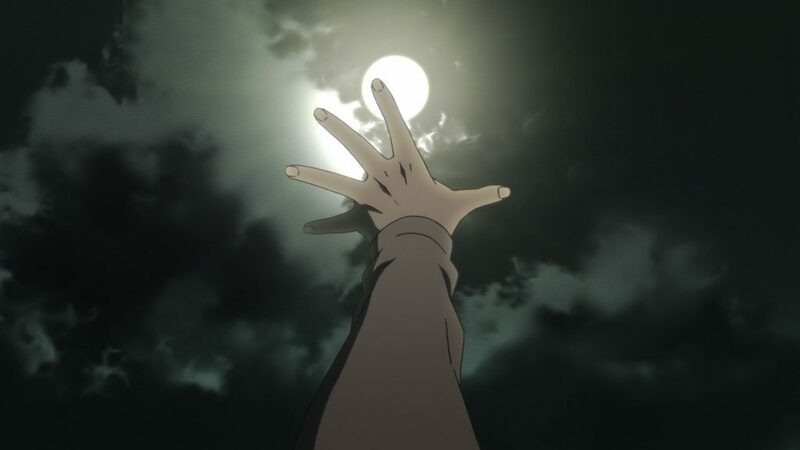 The scene where Mayaka notices Satoshi’s feelings and gently grabs his sleeve was particularly striking. Gatou: That follow-up scene was added for the anime. Gatou: It is a follow-up (laughs). Takemoto: It simply had to be included no matter what, or so I thought. Gatou: I was the one who came up with the grasping the sleeve idea! I clearly said so in the scenario meeting! Takemoto: …Is that so? I can’t remember (laughs). Gatou: Even I have that sort of sensibility! I’m not that much of a tactless person… probably (laughs). Takemoto: Rather than being tactless, you have kind of an American vibe. Gatou: An American vibe, huh~. Tactless is what people usually mean by that, don’t they? (laughs). Takemoto: No, no (laughs). There are many different kinds of American people! Gatou: There are lots of excellent American drama series, very sensitive ones too. Well, let’s leave it at that; what were we talking about again? Takemoto: The scene where Mayaka grabs Satoshi’s sleeve. In that particular moment, any words she might choose to speak to Satoshi would ring hollow. For this reason, I believe that her getting close was the most fitting way to comfort him. Gatou: That was the best approach, wasn’t it. Takemoto: It really was the best form of concern Mayaka could’ve shown to Satoshi. Gatou: Mayaka is a mature person in a way. I think if she had been more of a clueless girl, she would’ve condescendingly said something like “I understand your feelings, Fuku-chan, I really do!” and come across as irritating. Not saying anything instead and just grabbing his sleeve… what a schemer (laughs). Takemoto: Wait, no (laughs). Mayaka isn’t like that! Gatou: That’s right. She’s the kind of person who can make that gesture spontaneously. ─ There are scenes where Satoshi shows concern for Mayaka during the culture festival too, aren’t there? After that, the other three Classics Club members consoled Houtarou in episode 11.5 The Things We Hold On To which was distributed on USTREAM. Gatou: Correct. I’ve mentioned this last time too, but it’s also meant as a rehabilitation episode for the dejected Houtarou in order to establish a smooth flow with the next episode. ─ In the sense of rehabilitation, the scene where each of them tries to cheer up Houtarou is striking. That scene felt similar to the opening of The End Credits of The Fool with the cross-examination, but was that directional choice intentional? Takemoto: It’s not like it was made to look similar on purpose. Houtarou doesn’t signal to his surroundings that he’s hurt, and I don’t think he would like them to point it out either. Furthermore, I don’t think he had told anyone about his confrontation with Irisu in the first place. The other three sensed that something was on Houtarou’s mind and they had a rough idea of the cause behind it, but asking him directly would be tough and they knew that Houtarou wouldn’t give them an answer even if they asked him. That’s why I believe that this trip to the pool occurred, as each of them was about to search for clues and Satoshi happened to hear about Houtarou’s part-time job. Gatou: Satoshi is such a good guy. Takemoto: Exactly! Therefore, I don’t think he called out to Eru and Mayaka simply on a whim, but invited them because of his wishful thinking that something might come out of it. However, Houtarou won’t say anything when it’s the four of them, so each of them approached Houtarou on their own. ─ From here on I would like to ask you about the Order of Kudryavka arc in episodes 12-17. They were crafted with multiple character perspectives in mind just like in the source material – what sort of struggles did you face in the series composition phase? Gatou: Let’s see. It was a complicated story so I was racking my brain to streamline it and fit it into six episodes. There might be fans of the source material who think “How could they remove that part!” but I’m sorry, anything more than that was impossible! In the end, we used two episodes for the first day to illustrate the 3-days-long culture festival, though to be honest I wanted around nine episodes total (laughs). To my surprise, once we had the overall draft, there was still some breathing room in the first half, so I incorporated fun elements such as the cosplay nods and the fun festival atmosphere wherever it was possible. ─ So you included the cosplay, quiz tournament, cook-off and so on as those fun elements. Gatou: That’s right. I asked director Takemoto and the episode directors to make everything entertaining. In those segments, such as the quiz tournament or cook-off, characters from the End Credits Of The Fool arc make a brief appearance in the background crowd as a shoutout. They are included everywhere. ─ The cosplay became a hot topic. It was different from the outfits used in the source material, but was that an intentional decision? Gatou: It appears like the the Hsien-Ko cosplay in the source material was complicated from a copyright perspective. We didn’t get an outright denial, though. Takemoto: They were really patching things up there (laughs). I regretted the Vocaloid-related cosplay a bit actually. ─ What do you mean with regretted? Takemoto: We had finished the series composition about a year before the broadcast, so when we were deciding which cosplay to use, we wondered about characters who would still be easily recognizable much later. Then someone suggested Vocaloid and we went with it. However, once the designs had been finished, I realized “All the characters in Vocaloid cosplays are unlikable, now that I think about it…” (laughs). Gatou: Exactly! The kids in Vocaloid cosplays are the bad guys (laughs). Takemoto: And then when I saw the storyboards, thoughts like “I’ve never seen Miku Hatsune say such things before” went through my head. I checked them thinking that to myself. Gatou: We didn’t mean any evil intent or malice whatsoever to Miku-san and friends with that! It’s the truth! ─ That part was difficult to handle, wasn’t it? Well then, please tell us your favorite out of the cosplayers if you have any. Gatou: I found Kouchi-senpai, as Nakoruru from Samurai Shodown, fantastic. Gatou: She created a new genre after all: the strong-willed and slightly mean upperclassman wearing the cosplay of an innocent character. You can feel the incredibly conflicted inner workings of the mind that this gap gives birth to when you look at it (laughs). Much like there are people who want to tease others, there will also be people who want to be stepped on (laughs). Gatou: Scratch that ─ it’s “Nakoruru-senpai”. Gatou: Everyone said incomprehensible things like “Nakoruru-senpai dressed like King today” whenever she changed her cosplay (laughs). Takemoto: Dressing up as Mai Shiranui with that build was bold (laughs). Gatou: Seeing her bite off more than she can chew is kind of irresistible in itself (laughs). The most surprising thing was that it took until the very end of the Kudryavka arc before you could finally see her in her normal school uniform look. There might have been some viewers who thought “Who’s this person?” (laughs). Takemoto: Or a sudden realization that she has short hair. ─ I was surprised at the echo Nakoruru-senpai has caused. Takemoto: Nakoruru, King of Fighters‘ King, Fatal Fury’s, Mai Shiranui ─ I wonder if it would’ve been better not to limit it to SNK characters and harmonize them a bit more. Gatou: It’s quite the opposite, I actually thought how amazing she was for cosplaying nothing but SNK characters (laughs). She’s quite the beat ’em up game maniac! ─ She’s really devoted, isn’t she? 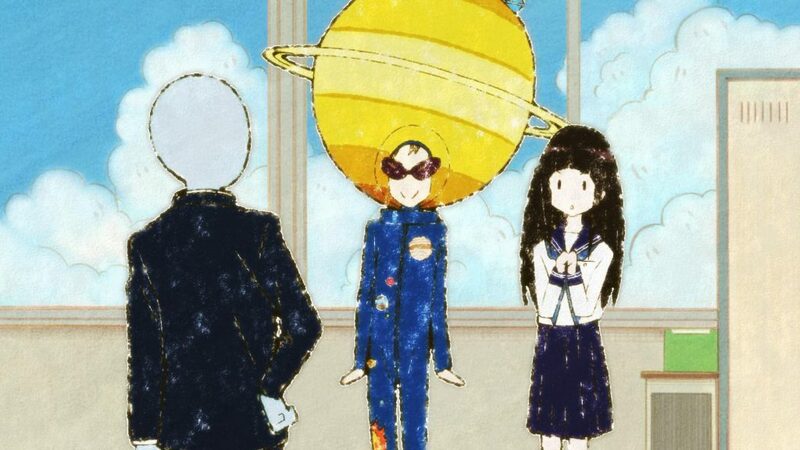 (laughs) Speaking of cosplay, Satoshi wore a Saturn-themed headgear too. Gatou: You mean “Galaxy!“, right? Takemoto: That originated from the “Sunflower!” he did in episode 3. Gatou: Since we had already done “Sunflower!“, I requested another idea from Katsuhiko Muramoto-san, who was responsible for the script in episode 3, and everyone said they were really looking forward to what he’d come up with. Takemoto: The expectations kept rising, didn’t they? (laughs) It seems like he felt quite pressured. Gatou: His first proposal wasn’t “Galaxy!” actually. What was it again? Takemoto: It was “Big Bang!” (laughs). Then I interjected with “Big Bang – and then what? You don’t plan to just end it like that, do you?” (laughs). Afterwards, we settled on “Galaxy!“. Gatou: Well, let’s leave it at that. That’s how it was (laughs). ─ This applies to this amusing detail too, but it appears that as a general rule you left quite a lot of room for creativity to the episode directors and scriptwriters in charge. Are there any results of that you want to share? Takemoto: It has to be their work on the first day of the culture festival. I found that festive atmosphere incredible. Gatou: That’s exactly how festivals are supposed to be like, in my opinion. It would’ve been bad if it had been a boring culture festival (laughs). I’m glad it turned into an atmosphere that really makes you think “Awesome! Look at all these people!! It’s a festival!!! Everyone’s having a blast!!!!“. ─ It was a densely packed culture festival, wasn’t it? From a voice actor perspective, it was extravagant as well. Gatou: It really was. Generally, the recording for the Kudryavka arc and prior arcs consisted of the four mains plus a few more, but during the culture festival there were more than ten people present each time, peaking at around 20. The recording studio resembled a festival too so we had a lot of fun. ─ Were there any anecdotes at the recording studio you found memorable? Takemoto: I’ve already mentioned this before but since this is a mystery show, there are countless pieces of information you absolutely have to express. Therefore, there weren’t many opportunities to ad-lib… and yet Tomokazu Sugita-san, who voiced the cooking exhibition club president, was acting freely (laughs). Gatou: That’s because we asked him to do so (laughs). Takemoto: You mean his live coverage of the cook-off, right? Gatou: It’s not like it was Sugita-san who went berserk there, but rather that he understood our aim and went on a rampage for us, actually. Takemoto: Once the recording of the first half was over, Sugita-san was on break and I talked with him about how he didn’t seem to be enjoying himself. Gatou: You sparked the fire in him, didn’t you? (laughs). Takemoto: I did spark a fire in him I guess (laughs). He really got into it, I found it fantastic. ─ Are there any episodes you found memorable due to the cast members’ voice acting in particular? Takemoto: Definitely the final episode. Many things happened at the time, but the most impressive event had to be the guest voice actors. Gatou: For Houtarou, it was an incredibly unfamiliar place so he wandered around restlessly. The voice actors for the old men awaiting him there were amazing (laughs). When Houtarou steps in and greets them, Masahiko Tanaka-san (as Sono) walks past right next to him and the one appearing and asking “Hm? Who are you?” is Unshou Ishizuka (as Hanai) (laughs). Then, when he gets told to step inside and walks into the waiting room, Tomomichi Nishimura (as Fukiya) and Shigeru Chiba (as Tanimoto) are there, while Issei Futamata-san (as Nakatake) is talking… At the end, Ichirou Nagai-san (as Takezou Yoshida) becomes furious and leaves. All cast members seemed like they had already voiced mercenary or mafia roles who might have a few deaths on their conscience (laughs). It was amusing during the recording when they talked about how they actually dislike such shrines in the countryside. ─ That really was shocking. This also applies to the final episode The Doll That Took A Detour, but an extraordinarily high number of characters appear in the culture festival arc. Please tell us your favorite out of the side characters. Gatou: I personally like Tanabe. He’s such an earnest person. Takemoto: I also like how deeply-rooted Tanabe’s jealousy is (laughs). I thought it was unusual for an intellectual type like him to feel that so ardently. Even though he’s such a bespectacled handsome guy. Gatou: Rather than deeply-rooted jealousy, at that point he’s already someone with a distorted character, isn’t he? Takemoto: True. I found that really nice. Gatou: You know, that felt like a BL trope (laughs). Takemoto: Really? I’m not that familiar with them (laughs). I genuinely just… really like how he is always thinking of the president. Gatou: He harbors an unrequited love for the president, doesn’t he? Takemoto: Exactly. That’s how I explained it to Fukuyama-san, Tanabe’s voice actor (laughs). Gatou: Fukuyama-san told me that it had been a while since the last time he voiced such a completely normal person (laughs). ─ Speaking of Tanabe, the president told him “Good work” at the end of the culture festival, but what kind of connotation did that have? Gatou: Originally, that part wasn’t in the scenario, but the episode director included it in the storyboards. Therefore, I can’t really say anything about that. However, my personal interpretation is that Kugayama didn’t understand Tanabe’s intention at all. Takemoto: I wonder about that. There are many opinions and extreme takes on the internet, but I want to leave it to the viewer’s fantasy. My own impression also was that the episode director in charge wanted to highlight Kugayama’s clueless side with that. ─ The interpretation differs depending on the person, doesn’t it. ─ In a previous interview, you said that you had firmly grasped Houtarou’s image around the end of the first arc, but were there any parts in the second cours you struggled with? Gatou: Rather than struggling, I came across elements that made me feel like we’d be better off rearranging things in some way or the other. For example, by having Satoshi apologize for various things, I reduced the severeness of his wrongdoing in episode 21 The Homemade Chocolate Case. Compared to the source material, it turned out quite smooth. ─ What was your mindset there? Gatou: Producer Itou had suggested to make it milder too. I got the feeling that it might stir up too much animosity from the viewers, that they’d feel it would be too cruel if I conformed the anime too much to the source material there. I had to keep in mind that the next episode was the finale for the anime, so I thought that it would be regretful if we concluded it with too unpleasant of a cutoff. ─ I see. You were not only taking the story and characters’ relationships into consideration, but also the experience of the anime viewers in particular. Are there any bits you changed in other episodes? Gatou: The other part I changed was the last scene in The Order of Kudryavka. In the source material, Houtarou suggests they throw a party to celebrate, but in the anime it’s Satoshi who makes that proposal. I thought that the transition to the episode afterwards wouldn’t feel right so I wrote that part while keeping those adjustments in mind. I believed that a clueless Houtarou was out of place there and wanted to emphasize the change in him a bit more, so I made it seem like he was picking up on the mood. ─ What do you think, director? Takemoto: I also thought that The Homemade Chocolate Case was the part that really needed to be altered, it felt like the best outcome for the anime. I’d like to entrust our judgement to the viewers, so they evaluate it. Gatou: Since it was written as standalone short story in the novel, there wasn’t that much of a need to establish a connection with the rest of the story; in the anime however, we told each story chronologically and recomposed everything so we also had to keep in mind the flow between episodes, and draft them as one continuous tale. Takemoto: It wasn’t only Satoshi, the girls were pretty harsh too. You could catch a glimpse of their self-centered way of thinking and actions. Gatou: That’s what you call cunning, isn’t it? Takemoto: Yep. However, when I took into consideration that the four of them would be coming to school and facing each other the next day, I thought that it would be troublesome to adapt the source material into the anime as it were. Gatou: Normally, nobody would come to the Classics Club’s room after becoming 11th graders to begin with. That’s the most realistic scenario (laughs). 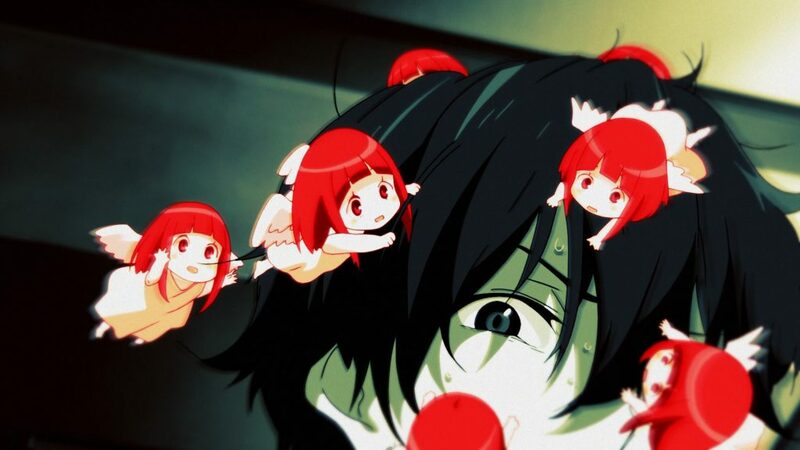 ─ In the source material, the day of the incident is illustrated as well, so there’s supplementary information and he doesn’t come across as unlikable to the readers – when you had to portray it into the anime though, that became troublesome. This was one of the reasons why you made it milder, isn’t it? Takemoto: Correct. Having the quartet’s results, which they worked towards for that past year, fall apart right before the end would be just too sad, hence why we started making arrangements there. However, we thought that by making it milder, we might be called cowards so it was frustrating (laughs). Generally speaking, that part slightly diverged from the bittersweetness I personally wanted to depict so I altered it. Simply put, my understanding of that bittersweet feeling is that the person hurting others is hurt too. For example, when it comes to Irisu in the End Credits Of The Fool arc, she didn’t do all of that because she wanted to. When she weighed her options between Houtarou and the 11th graders from class F, she just happened to select class F, unfortunately. Therefore, she couldn’t bring herself to let Houtarou act out that role but she decided that there was no other way around it. Gatou: Originally, Irisu was supposed to resolve the conflict smoothly but Houtarou and the others were more skilled than she had expected. Takemoto: Yep. Considering that, she made up her mind to play the role of the villain. I regard that aspect as bittersweetness. However, there’s no such thing in the episode with the Zenna sisters. During your early childhood you can only parse things as white or black, the concept of gray doesn’t exist yet. I thought that showing the cruel side of children, who don’t yet know what that gray is, didn’t fit the bittersweet theme. I changed that last scene in the anime for this reason. ─ So you made those changes in order to match everything with the overarching theme. Well then, director: you deeply love Houtarou, so how do you feel about his changed self in the second half of the show? Takemoto: Compared to the very beginning, I think the characters steadily became gentler as we kept illustrating them. His facial expressions in particular got much richer, making him increasingly cuter. Gatou: It was so noticeable that I felt his femininity would skyrocket at that rate. Takemoto: That wouldn’t be bad either (laughs). ─ At the beginning, it looked like he tried to shield himself from Eru’s “I’m curious about it!” but in the latter half, it seemed like he understood that warding it off is impossible by now. Takemoto: It’s not like his personality did a 180, so I think he’s still not proactive at heart. Of course, he would be pleased if he didn’t have to make much of an effort, but he’s learned his lesson – namely that he can’t escape from Eru (laughs). I suppose he now tries to solve the mysteries and bring the case to a close as fast as possible. Gatou: Well, I guess it just means he got used to it (laughs). It’s definitely not like he approves of it all but he has adapted, or rather acclimatized to it. ─ In the culture festival, there is also a scene where Houtarou greeted by a friend outside of the Classics Club. Gatou: You mean the scene where someone from his class spoke to Houtarou during the opening ceremony in the Kudryavka arc, don’t you? That made me realize that he does have friends (laughs). Eru talked with a girl from her class as well, establishing the shocking fact that they have other friends. Takemoto: Shocking!? It’s only normal that they would have other friends too (laughs). Gatou: I always thought those two wouldn’t have the richest social life at school (laughs). Takemoto: That’s way too cruel (laughs). Gatou: Houtarou seems like the type that would spend the whole summer holidays without meeting anyone. Takemoto: Houtarou is indeed the kind of guy who would do that if push came to shove. ─ One of Houtarou’s most charming moments was in episode 16 where he claims that they’re dealing with an adult topic in order to keep Eru away. Gatou: You mean the part where he says “But it involves a very adult topic“, right? I actually told the director I wasn’t quite sure if Houtarou would just blurt out an excuse like that out of the blue. Takemoto: I don’t see a problem (laughs). Gatou: I wasn’t convinced that the anime’s interpretation of Houtarou would say such a thing (laughs). But since everyone insisted, I guessed it should be fine. ─ I think it turned out into a memorable scene even if you haven’t read the source material. Gatou: By the way, there’s a skit based on that scene in the drama CD that’s included in the disc releases. When Houtarou says “But it involves a very adult topic“, Eru retorts with “Please do tell me about it!” (laughs). Gatou: Then Mayaka jumps in with “I want to hear it too!“, and Houtarou and Satoshi become very perplexed. Something along those lines happens there. ─ That sounds amusing. Moving on: in episode 18 you animated the short story Are The Mountains Sunny?, which was published in Yasei Jidai and hadn’t been bundled in a volume yet at that time, taking fans of the source material by surprise. Why did you pick up this vignette? Takemoto: It was partly because that vignette is just excellent, but also because it captures the change in Houtarou and Eru’s feelings, so we decided that we couldn‘t leave this one out. Gatou: By inserting it at that particular place in the story, it becomes easy to interpret that Houtarou has changed as well so I really think it was a perfect match. ─ While fantasizing about lightning striking, there’s that scene where a mushroom gets hit three times consecutively. Takemoto: Ah, that’s because shiitake mushrooms are mentioned in the opening scene. It appears like the episode director in charge was adamant about those in particular (laughs). ─ I assume Ogi-sensei got struck by lightning on three separate occasions, though that illusion scene made it look like he was struck three times in a row, like some sort of sick combo. Takemoto: I don’t think he was struck by lightning three times in a row. He’d have died for sure in that case (laughs). Gatou: Getting struck with a bang once more right after the first time… (laughs). Takemoto: Usually you’d die after the second time or so! Gatou: Just as he was completely limp, the finishing blow comes (laughs). ─ (laughs). The tale after that was based on the short story The Doll That Took A Detour, following the source material in chronological order. Takemoto: We depicted exactly a whole year with Houtarou and co.
Gatou: There were a lot of vignettes simply about their normal daily lives after The Order Of Kudryavka, weren’t there? Takemoto: I don’t think so? Wouldn’t you say episode 21 The Homemade Chocolate Case is lovey-dovey? Gatou: That’s lovey-dovey? I guess it counts because Satoshi and Houtarou are acting flurriedly, collars are grabbed and they become really close. Gatou: It seems like Utsumi-san, who was in charge of episode 21, put all her soul into that moment… Nah, I’m just kidding (laughs). ─ You just mentioned the term lovey-dovey; in the previous interview you said one highlight in the second cour would be LOVE. Takemoto: That’s a crucial part, isn’t it! Gatou: We said LOVE but it’s not really that clichéd. For example, Eru becomes overly conscious of Houtarou after he has seen photos of her in cosplay during the culture festival. However, they eventually get close again. I wasn’t quite sure about how to express that distance myself, but in the end it feels natural because it’s Eru (laughs). Takemoto: That’s right. It feels like business as usual (laughs). Nothing a good night of sleep can’t cure. ─ I guess this means everything went back to normal (laughs). Speaking of love though, I could feel how much of it you poured into the second cour’s ending. The animation is simply adorable. Takemoto: True. Since the song was so cheerful and adorable, I decided to make the visuals cute as well. I worked on them alongside character designer Nishiya-san, while discussing various things such as “Wouldn’t it be cute if the outfits were like this?” and “Wouldn’t it also be cute if the boys wore these outfits?”. Gatou: I feel like you don’t see that sort of ending anymore lately. Takemoto: That’s why I get told it has a Showa period aura (laughs). Gatou: It feels like a bit like… it belongs to a prime time show from a few years ago (laughs). Takemoto: I’m not sure if you’re praising or speaking ill of it (laughs). Gatou: I am praising it. It’s the good kind of Showa! Like Always: Sunset on Third Street (laughs). There are good 80s and bad 80s. Gatou: Anyway, that ending is from the good 80s! Takemoto: Thank you very much (laughs). Gatou: It was great how cute that ending was, though it’s a shame this one isn’t seductive (laughs). Takemoto: A shame you say (laughs). ─ What are your thoughts on the new opening? Gatou: The second cour’s opening is even livelier, it’s such a cheerful sequence that lets various secondary characters make an appearance too. Their lives seem even more fulfilled so you might catch yourself thinking “Geez, you popular kids should just die already, damnit!” (laughs). Something along these lines. 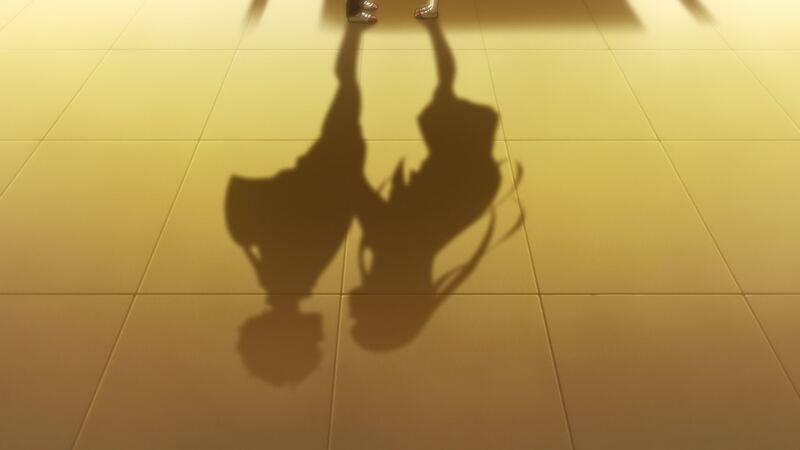 ─ Now that the show is over, please tell us which elements you’d like fans to focus on if they plan to watch Hyouka on Blu-ray or DVD in the future, whether for the first time or revisiting it. Takemoto: I would be glad if you enjoyed it as a glimpse into a year in the quartet’s high school days – the four of them had lives before they enrolled into Kamiyama High School, and they will continue on after this one year period. It would be delightful if you felt like you experienced a year in their lives. Gatou: I agree. Of course there will be people who have already seen it amongst those who purchased the Blu-rays, but I believe that it’s a series worth returning to – it might be much more entertaining than you can even imagine! There’s always new discoveries to be made, and I’m sure you’ll notice all sorts of fun details. So please watch it all unfold all over again, from the beginning of the story. Originally published in the sixth 2012 issue of Otona Animedia. Translated by Pen, who will be spearheading this special Hyouka project.